What Is Sphagnum Moss Used For? Does Dry Sphagnum Moss Turn Green? How Long Does Sphagnum Moss Take to Turn Green? Sphagnum moss is a shallow-rooted bog plant. Its capillary structure makes it very absorbent. Dried sphagnum moss is often used as a decorative mulch for dried flower arrangements. Fill a large plastic tub or container 3/4 of the way with peat moss. Peat is a a good substrate for growing other mosses. Add water to the peat moss substrate. The peat should be damp, but not dripping wet. Take cuttings from the top 10 cm of actively growing sphagnum moss. Cuttings taken below this level have a higher failure rate. Chop the cuttings into separate lengths that are 1 to 3 cm. Scatter these cuttings evenly over the peat moss. Cuttings taken from 1 square foot of live moss should be enough to start aabout 10 square feet of moss in containers. Mist the top of the sphagnum moss regularly until it starts to grow. 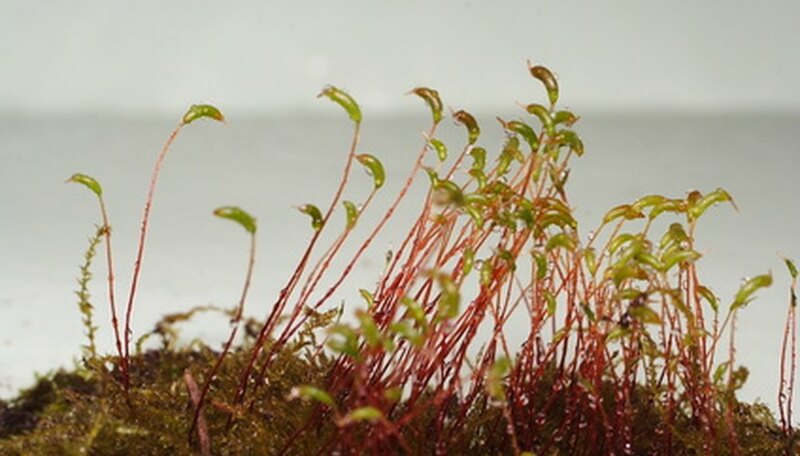 After it begins to grow, occasionally flood the moss with 1 to 3 cm of water. Consider partially covering your container with clear plastic to retain humidity in the container in a very dry climate. Keep the container out of direct sun. A good location for sphagnum moss is along one side of a room with a medium or large window where sun shining through the window won't hit the container. Fill the spray bottle. Cover the bottom of the spray bottle with one inch of powder or liquid tide. Then fill it the rest of the way with a 10% bleach solution. Spray all patches of sphagnum moss liberally. Wait 24 hours. If the sphagnum is still alive, re-spray it. Repeat until all of the sphagnum is dead. Clear any overhanging foliage that prevents direct sunlight from reaching areas where sphagnum moss grows. This will help dry out the area and keep it from growing again. And if possible, reduce the amount of moisture in the area. Sphagnum moss is green when it is alive. When it dries out, it turns brown. Sphagnum moss is a common ingredient in potting mixes for gardening. It helps provide aeration, according to the University of Connecticut. The scientific name for Sphagnum Moss is Sphagnum spp. Sphagnum moss is also commonly called bog moss because it can be found in wet soggy areas in moors and water holes. Live sphagnum moss has green, brown, red, pink or yellow leaves. Dried sphagnum moss is brown. Once dried, sphagnum moss does not start growing and become green again. Highly water-absorbent, sphagnum moss is an excellent plant growing medium. Wet the sphagnum moss with clean, tepid water to make it pliable and easy to work with. Slide the orchid out of its old pot and planting medium and carefully brush the old medium from between the roots. Wet the roots under tepid running water to rinse off old medium and hydrate them. Fill the new orchid pot one quarter of the way full with chunks of wet sphagnum moss. Set the orchid in the pot and spread the roots evenly without breaking or straining them. Gently push bits of wet sphagnum moss into and around the table of roots using your fingers or the eraser end of a pencil to fill in around the roots so that they are touching the sphagnum medium but are not compacted in it. Place the orchid back in its usual growing location watering weekly and fertilizing monthly as usual.